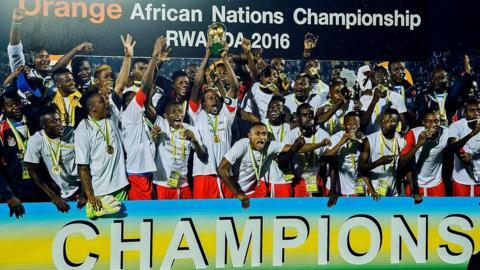 African Nations Championship winners Democratic Republic of Congo have accepted an invitation to participate in the Cosafa Cup in Namibia in June. DR Congo will replace the Comoros Islands, who withdrew for a second successive year. Originally scheduled for May, the tournament is now being staged from 11 to 25 June after hosts Namibia requested a change of dates. It means DR Congo could also include foreign-based players in their squad now that the tournament does not clash with the next round of African Nations Cup qualifiers. Last year, Ghana competed in the annual southern African championship with a team of home-based players but suffered an embarrassingly early exit and failed to deliver on the box office appeal the organisers had been hoping for. DR Congo will go into the 14-team tournament as the top-ranked side and will participate from the quarter-final stage onwards. The draw will take place on Monday, 25 April in Windhoek when the 14 teams will learn their fate and their seeding based on the April 2016 Fifa rankings. The tournament has for several years now been divided into two parts. In the first week there is a group competition with two groups of four. These eight countries are the bottom eight in the rankings but each guaranteed three games. They will be Angola, Lesotho, Madagascar, Malawi, Mauritius, the Seychelles, Swaziland and Zimbabwe. The two group winners are then joined by the six top-ranked nations (DR Congo, South Africa, Zambia, Botswana, Mozambique and Namibia) for the final knockout phase. But countries eliminated at the quarter-final stage still get to play at least one more match in a plate competition. Zambia and Zimbabwe have each won the Cosafa Cup on four occasions since the competition was first played in 1997. South Africa and Angola have three titles each, while Namibia claimed their first championship when they defeated Mozambique 2-0 in last year's final.